Last updated by Marcia Mayne at April 7, 2014 . Traveling through Jamaica’s rural areas is something I look forward with as much anticipation and excitement as a child waiting for a birthday or Christmas. It’s always a treat because I never know what I’ll see. Several months ago, I was driving with three of my neighbors from Clarendon on the south central coast back to Montego Bay on the north west coast. 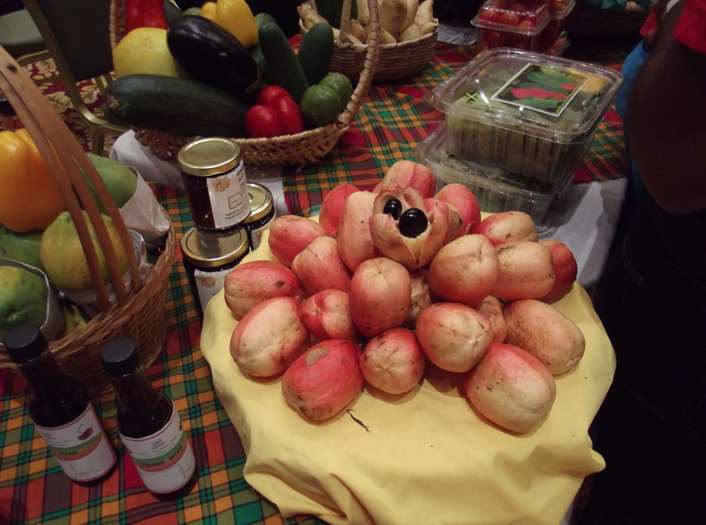 Our trip took us through parts of Trelawny, St. Ann and Manchester – all well-known for different types of produce. This particular Friday afternoon was bathed in the warm, golden glow of the setting sun as, at almost every turn, we saw farmers bringing their produce on donkeys and in small carts from the fields to the side of the road. Pickup trucks would take it the rest of the way to market. There were mounds of yellow yams, mostly. But there were also otaheiti apples, Scotch Bonnet peppers, scallion, and thyme. Usually, price dictated whether we’d stop but when we saw this man with his son, something about him made us decide to buy. As soon as we found a good spot to park, all four of us jumped out of the car and ran across the road to choose a piece of yellow yam. They were weighing and sorting the freshly dug yam, the soil stubbornly clinging to each piece. They looked so delicious, it was difficult to know which to choose. So we let him decide. Yam adds potassium, protein, vitamins and folic acid to the diet and because it is packed with soluble fiber, it is suitable even for young children. Yams are also great for people with diabetes as it slows down the release of sugar into the cells. Yams are denser in texture than the potato and can be eaten boiled (and mashed with butter, my favorite) or roasted. One of the things I look forward to on road trips is buying roasted yellow yam and saltfish from roadside vendors. Most Jamaicans love yellow yam and have it at breakfast, lunch and dinner. It is even the title of a popular folk song, When wi roas di yellow yam. Take a listen here. When Olympic champion, Usain Bolt, won gold in the 2008 Olympics in Beijing, his father was reported as saying his speed was due to his diet, specifically the yellow yam. Not surprising as Bolt is from yam country, Trelawny. Welcome to another #FoodieTuesday linkup! Would you eat something called blue drawers? Don’t answer just yet. Read on then let me know later. Jamaicans have a knack for christening people and things with more descriptive names. Some members of my family did it. If someone reminded them of something else or if the person had a prominent feature, they’d call that person, behind their backs, of course, by that name. That’s what happened with Blue Drawers. But no one seems to know how this little pudding ended up with this colorful moniker since it’s not blue – though during the cooking/steaming process the banana leaf turns the water a slightly blue color – and it’s not drawers either. Blue Drawers, also called Tie-a-Leaf or Dukunnu came to Jamaica from West Africa. Dukunnu, in the Akan language, means boiled maize bread. Blue drawers is typically made from cornmeal, but it can also be made using green bananas, cassava, sweet potato or yam, which is grated and mixed with sugar and spices. 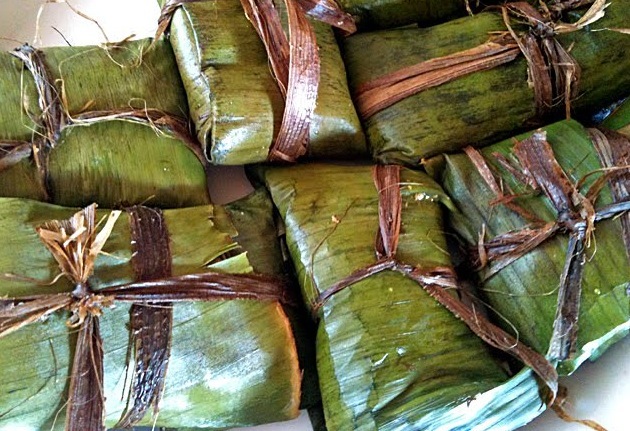 It is then cut in squares, wrapped in banana (or plantain) leaf. 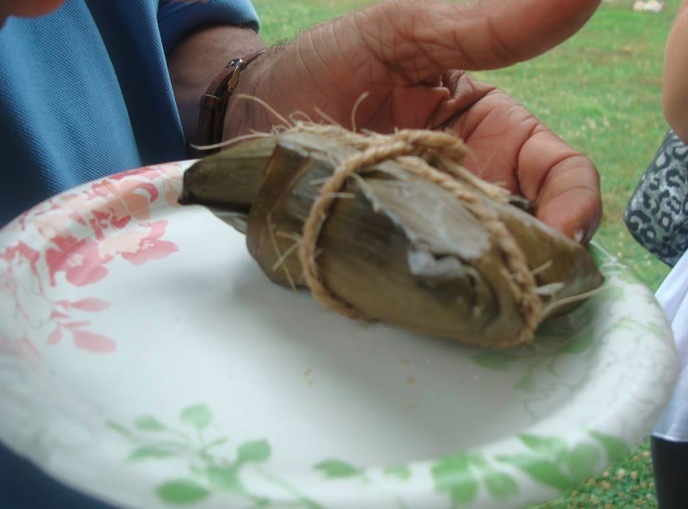 tied in small packages with a string (or banana bark, hence the name tie-a-leaf) and boiled or steamed. It can be eaten at anytime. I hadn’t thought of, or seen, Blue Drawers in several years and was surprised to see it this past weekend at my family reunion. It wasn’t on the official menu but there it was, stacked three or four deep in an aluminum container, next to the usual breakfast items. I didn’t try the blue drawers right away. When I returned later, the container was empty. Cut the center vein of the banana leaf. Soften or ‘quail’ the leaf by holding it over an open flame or boiling water until the green leaf turns dark. Set aside. Put water in a large pot to boil. Blend dry ingredients and grated coconut thoroughly. Mix wet ingredients, then add to dry ingredients. Stir briskly. Place enough of the mixture into the center of banana leaf to make a 4-6” square. As if you’re wrapping a gift, fold each side of the leaf to the center; making sure it overlaps to keep the parcel waterproof. Use twine to wrap the bundle lengthwise and crosswise. Repeat until the batter is used up. Place each package gently in simmering water that should be just enough to cover all the parcels. Cook for about 40 minutes, or until filling feels firm to the touch. Plate and serve blue drawers. So would you eat blue drawers? Leaving a comment. As a courtesy, please leave a comment on the other posts. Looking up at a breadfruit tree laden with fruit, I heard an older gentleman remark to no one in particular, that it’d be a rough year. Breadfruit, he continued, as if revealing some truism that was lost to this younger generation, is always plentiful during hard times. His words echoed in my head each time I noticed tree after tree that was covered in the slightly oval fruit that grows to the size of a large grapefruit. And as the value of the Jamaican currency fell to unprecedented levels against the US dollar this month, I began to wonder whether this abundance of breadfruit might really be a harbinger of hard times. Maybe now, I thought, that prices on basic food items begin to creep upwards and salaries that have stayed flat buy less and less at the supermarket, its time to turn to this nutritious, and often overlooked food. The breadfruit was brought to Jamaica in 1793 by Captain William Bligh of the unfortunate HMS Bounty, precisely because it was considered an inexpensive and nutritious way to feed the large number of slaves who worked the island’s then numerous sugar plantations. Bligh, an experienced navigator, who had lived near Lucea, Hanover from 1784-7, had sailed ships of sugar and rum from the island to England while he was in his uncle-in-law’s employ. His ill-fated expedition to the South Pacific to bring back breadfruit and other plants ended in the now infamous mutiny in which Bligh not only lost his ship, he also lost the specimens he had collected. He and 18 of his trusted crew were given a small boat which Bligh piloted 3,618 miles to Timor aided only by a quadrant and pocket watch, and his memory of charts he had seen. On his return to England, he was promoted to captain and in 1791, returned to Tahiti on the Providence for more fruit. It was from this shipment that Bligh delivered specimens to the island of St. Vincent and Jamaica’s Bath Botanical Gardens in St. Thomas, and Bluefields in Westmoreland. Today, hundreds of varieties of breadfruit can be found in nearly 90 countries from the Pacific Islands, to Southeast Asia to the Caribbean and Central America. Left untouched, a tree can grow to about 85 feet, and yield between 150-200 fruits each year. One hundred grams of fruit has 27 grams of carbohydrates, 70 grams of water, as well as vitamins, potassium, calcium, magnesium, and other minerals. While the easily grown trees, with its distinctive large, cut leaves, flourished in Jamaica, it took more than 40 years for the breadfruit — the taste is sometimes described as a cross between a potato and a plantain — to become popular to the local palate. Now, every household has at least one tree in its backyard and breadfruit or breshay is a staple of our diet, eaten at breakfast, lunch, dinner, and even as a snack. It is baked, fried, boiled, jerked, roasted and juiced. We also make chips, porridge, dumplings, salads, fritters, cakes, muffins and puddings from this almost year-round fruit all the while being mostly oblivious to the story behind their introduction to the island. Given a choice, I take breadfruit over rice every time. A few slices of the young breadfruit give soups ‘body.’ The ‘fit’ breadfruit, when boiled is soft enough to be mashed like potato and eaten with butter. The ripe or slightly ripe better yet a yellow heart breadfruit is mandatory for roasting. For the unlucky few who don’t have a tree in their backyards, breadfruit can usually be found in local markets. Roasting breadfruit is typically higher in price. Depending on location, they are between $0.50 and $1.00, and between $0.30 and $0.70 for boiling. One of my favorite breadfruit recipes is baked breadfruit stuffed with ackee and saltfish. Prepare ackee and saltfish, as shown below, and set aside. Preheat oven to 350 degrees. Remove the stem from a medium breadfruit, rub with butter or brush with olive oil, and wrap in aluminum foil. Bake breadfruit for 35-45 minutes or until tender. Test whether a knife or skewer inserted into the breadfruit comes out clean. Remove the breadfruit’s core (heart), stuff with salt fish and ackee. Rub more butter or olive oil on the outside and return to the oven. Bake for about 15 minutes. Let cool then cut breadfruit in half. Garnish and serve. Soak saltfish overnight or boil to remove the salt. Drain. If boiled, let it cool before removing and discarding the skin and bones. Flake the fish. Heat the oil in a large frying pan. Saute onions until transparent then add chopped tomato, pepper and thyme. Add saltfish and mix with onions, tomato, pepper. Fold in ackees and stir gently so the ackees stay whole. Simmer for about 5 minutes. Remove from heat, garnish with sweet pepper or use as stuffing for baked breadfruit. This is my submission to Travel Photo Thursday, which is organized by Nancie at Budget Travelers Sandbox. Be sure to head over and check out more photos and stories from locations around the world. Jamaicans have a passion for mango and during mango season, everyone gets to indulge, sometimes eating enough of the fruit to replace a meal. Mangoes are so loved here, there’s even a folk song, called appropriately, Mango Time, that celebrates the delicious fruit, and up to a few years ago, there was a mango festival in the parish of Westmoreland. Mango season starts around April or May and ends about July, though there is at least one variety, the Tommy Atkins, which comes in around September or October. If you’re a mango lover and are planning to visit Jamaica in the next few months, you’ll be in mango heaven. Trees are laden with mangoes; they’ll be on sale at almost every roadside stall, and included in the breakfast buffet at your hotel. In the height of the season, the aroma of the ripened fruit will hang in the air. Mangoes are native to South Asia, where they have been grown for more than 6,000 years. They were introduced to Jamaica in the 1700s after several varieties were discovered on a French ship that was destined for Hispaniola. The ship was captured at sea by Lord Rodney and the mangoes brought to the island. Food is an integral part of our lives. And on Thanksgiving, we give thanks with one of the biggest feasts of the year. Thanksgiving isn’t an official holiday in Jamaica though some Jamaicans who’ve returned home have brought the tradition with them. What we have that’s similar is harvest. At the harvest, members bring produce to their church to receive a blessing from the priest. These bananas are called honey, because they’re naturally sweet, sweeter than regular bananas. They are also smaller than average bananas, probably a half or two-thirds in size, and are quite popular in Jamaica. Honey bananas sell fast despite the fact that they’re usually more expensive than regular bananas. These bananas are called green to differentiate them from the yellow ones, which most people are familiar with. Green bananas are boiled and often eaten with steamed fish, ackee and salt fish or other meats. It’s also used to make porridge, dumplings or put in mannish water soup, a soup that is made from the head and intestines and other parts of the goat. 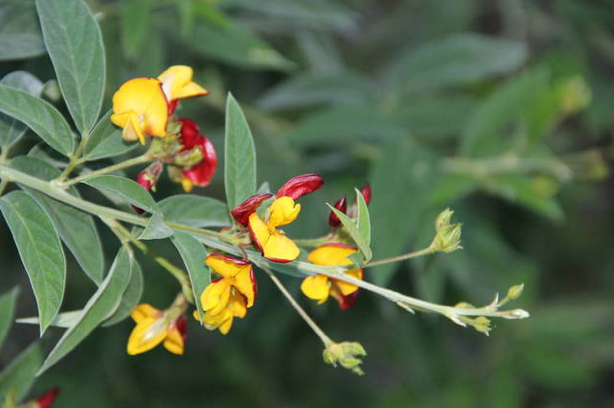 It is believed to be an aphrodisiac. We picked these avocados at the home of one of my cousins. Since they weren’t quite rips, we wrapped them in newspaper to speed up the process. The breadfruit was brought to Jamaica by Captain William Bligh between 1780 and 1786. Roasted, it is is the perfect accompaniment to ackee and salt fish, our national dish. 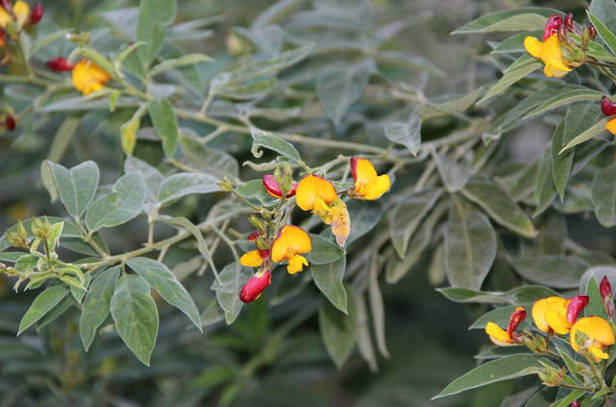 It can also be eaten boiled, fried, used in soups, and made into chips. For roasting, I prefer them a little ripe or turned. They are a little sweeter and softer. In soups, I prefer them what we call, young, meaning not ripe. Breadfruit can also be referred to as full, ready. The main ingredient in ackee and salt fish, our national dish, ackee was brought to Jamaica from West Africa. It’s ackee season now and the trees are laden with fruit. Ackees contain a poisonous gas and must be opened before they are picked. 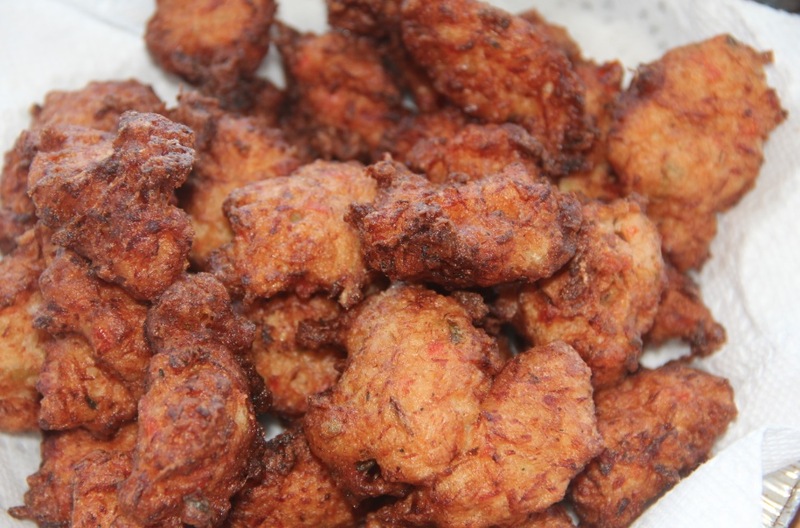 Jamaican cooks and chefs have been experimenting with how they prepare ackee. 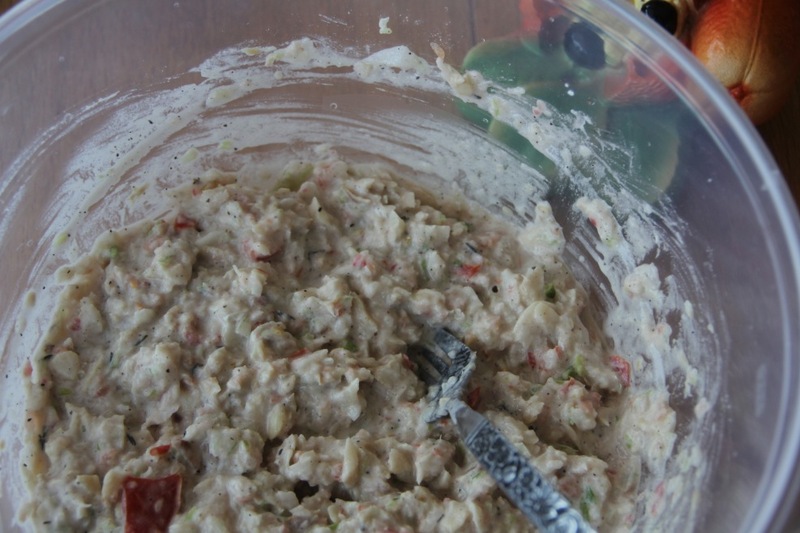 Moving away from the traditional marriage with salt fish, ackees can be curried, or used in bruschetta and cheesecake. A bountiful harvest of fruits, vegetables and produce. Happy Thanksgiving! 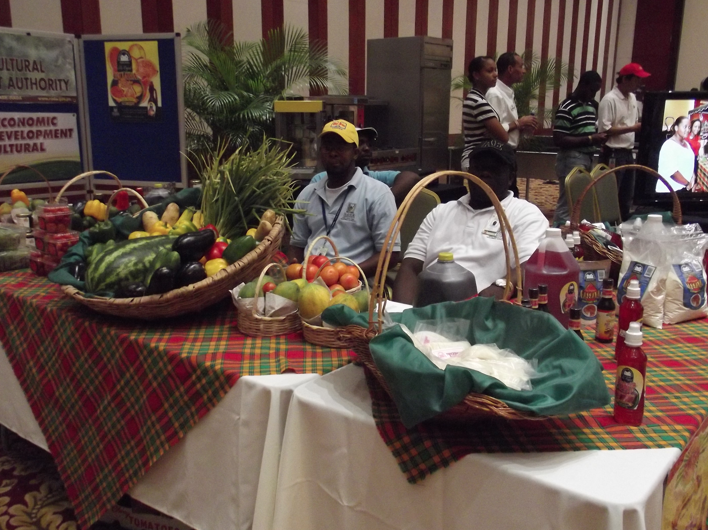 The Taste of Jamaica, a display of local foods and culinary contests, was held over the weekend at the Convention Center near Montego Bay. Here are some photos of the event. I’m still trying to sort out my internet connection, which is spotty at best. As a result, I haven’t been able to spend much time online. Please bear with me, I promise to get to your comments and catch up on all the posts that I’ve missed. I’ve created several lists to help Tony plan his trip to New York City this fall but I hadn’t come up with recommendations for places to eat until today. Since Tony plans to return to the same Times Square area hotel he stayed at before, I’ll focus on the restaurants in the 9th Avenue corridor, arguably one of the best areas to dine in the city. What I love about this area is that the ethnic diversity of New York City is reflected there. There’s Italian, South African, Indian, Thai, Mexican, Caribbean, American, Middle Eastern, African – you get the drift. Another thing I also love is that you can have a delicious meal for under $20 per person. And if you only want to have a drink, you have a choice of bars and pubs there as well. So, if you’re in the Times Square/Port Authority area, the only reason for you to be hungry is if you’ve run out of money. El Papasito*: Dominican – I was introduced to this restaurant by a Dominican colleague and have been going there for over 10 years now. The food is tasty, fresh and filling. Love their chicharron de pollo (fried chicken), mofongo (mashed plantains), tripe soup and lemonade – 346 W 53rd Street, btw 8th & 9th Avenues, 212-265-2225. Churrascaria Plataforma: Because I don’t buy or eat much beef, I’m always surprised to see beef so proudly displayed, as you’ll notice at this Brazilian all-you-can-eat steakhouse. Thankfully, beef isn’t the only thing on the menu. It’s a little pricier than the restaurants I’ve listed above but it’s worth experiencing. 316 W 49th Street, btw 8th & 9th Avenues.